Before I went writing the software, I had to ask myself: is my hackish hardware sufficient to differentiate between the various ways to touch the sensor? One of the more intuitive ways to check that is if the measurements actually differ enough. Time to record the measurements and plot some data! These are the raw measurements from the AVR. Vertically is the AD-value read from the pin connected to the envelope detector, horizontally is the divider value the PWM-generator uses. The frequenty actually is 10MHz/(div+1). 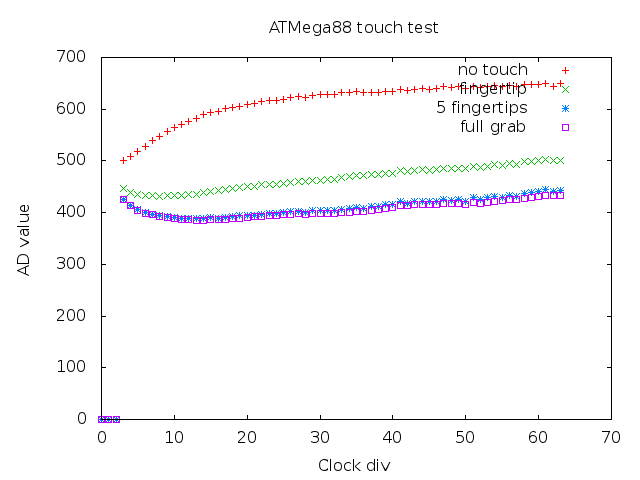 As you can see, the various methods to touch the sensor all have fairly distinct response patterns. A machine learning algorithm should be able to differentiate between them without too much trouble. 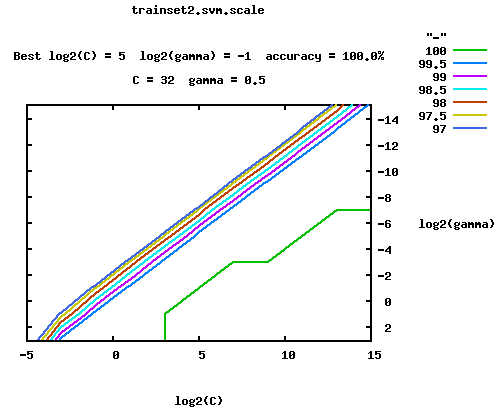 After that, it was only a matter of adjusting my software to load in the model, scale the incoming measurements and run the classifier on it.